Ask any non-headphone obsessed person what the best sounding set of headphones are and usually the response would be Bose. The company has been prominent in the upper tier of the Audio game with their speakers for as long as I can remember and they were at the forefront of some of the best ipod docks of the noughties. I, myself, had a full bose speaker and sub system setup in the 90’s and some of the all in one systems after that. However, I have never owned a set of Bose headphones, earphones yes, which for all intents and purposes are terrible, but headphones no. Why not? Well the sound was never up to par whenever I demoed them, however now with doing a lot more traveling I thought it would be an idea to check out the so called kings of noise cancelling, the Bose QC25. Packaging is quite nicely styled with lots of information about the earphones. The graphics are very cool and anyone should be happy with getting it as a present. The headphones themselves are very well protected as you would expect and presented in a nice way inside the custom carry case. Accessories are good in that all the bases are covered. An nice looking fairly small carry case starts things off which being so small makes it perfect for travel when limited with carry on luggage. You get an airline jack that very cleverly slots into the case, which is very cool and should prevent you from misplacing it. You also get a AAA battery so you can use the headphones with noise cancelling right out the box. Finally, there is the cable which is a little prone to kinking and tangling and has the ridiculous choice of some stupid non 3.5mm jack at the headphone end. There is no excuse not to use a 3.5mm jack here other than they want to sell you more cables if you break the original. The QC25 are a good-looking headset and one of the best looking when on ear, at least I think so. They are ridiculously light (at just under 200g) but still seem to be able to take a good amount of punishment. The pads are also very nice and they have just the right amount of clamping pressure so as to stay put but also be comfortable enough for hours and hours of usage. UNPARRALELD. That’s right there is simply nothing that I have ever heard that manages to block out external noise quite like the QC25. Its almost creepy and feels strange at first, almost like a pressure build up. You do get used to that however and you are rewarded by absolute peace and quiet. I used them on recent flight from the UK to Germany and I pretty much did not hear a thing the entire duration, no background chatter, no engine noise, nothing. Its true when people say that this is the way to go if noise cancelling is your number one priority. 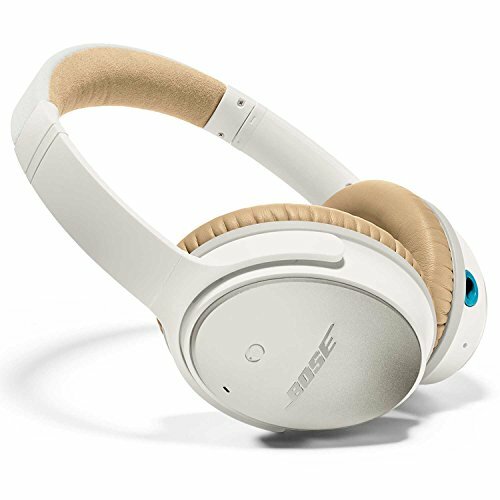 There are 2 ways to listen to the Bose QC25, with and without the active noise cancelling. I will say straight off the bat that with the Noise Cancelling turned off the Bose QC25 is straight up terrible, as in, atrocious. I can picture the unpleasant response from the PR team here but I have to be honest, for a company that tries to claim superior sound quality there is a tonne of better sounding options out there for even $30. The sound is sucked out and almost hollows sounding. Bass is weak and sloppy, vocal are thin and with no weight behind them at all. This is no exaggeration its just a really poor sound with the DSP off and I think it could be as a result of concentrating on these being used with NC on and the off mode as and afterthought. Now with the noise cancelling it sounds about on a par with most $100 consumer headphones. The QC25 are reasonably laid back and non-fatiguing and acceptable for a long listening sessions. There really is no point going into great depth here, its decidedly consumer and average, sounding just below something like the Beats Studio or on a par with Skullcandies mid tier models. Highs – Highs are very pushed back and there is not a great amount of detail here. There is certainly not a hint of sibilance, which is a plus point given that some of the most common users of the earphones are commuters or regular fliers. You could listen to these hours on end and not feel the need to take a break from excessively sharp treble. Mids – Mids are actually ok and there is some good weight behind vocals. It is lacking in energy though which is especially prevalent in guitars though. Unfortunately there is a fair bit of bleed from the sloppy low end into mids at times which is unpleasant but nothing to offensive if you are coming from any sub hundred dollar can that you can buy on the high street. Just like the treble the mids are laid back and there is none of the upper mid peaks that could be detected from my listening test (something a few complained about on the QC15). Lows – Lows really is the part of this headphone that manages to offend the most. The lows are muddy congested and slow sounding, they bleed heavily into the mids and there is also a high level of distortion at the upper volume limit. I really expected more from them but they were severely lacking in bass quality and I hope in future models that there is something done to tighten up the lower end. Now you might be thinking that this was a disaster I mean they sound terrible right? Well to an audiophile or fan of higher end portable audio gear they do but to the average consumer on the street they probably sound very good. Its down to what you are used to and at the end of the day the focus of these headphones should not in fact be the sound quality but rather the excellent sound cancelling and for that reason, I can forgive them their shortcomings. I would and do listen to these in transit/public/commuting over any other headphone. That’s right if you aren’t caring too much about the technical details of the sound there is no better way to block out the outside world and listen to your music in peace than with the Bose QC25. This really has been a mixed bag of a review. Even so I would 100% recommend anyone that does a lot of travel/commuting or work in a busy office to buy these headphones, I will be keeping mine and I will be using them… a lot, and especially on flights. They are ridiculously comfortable, non-fatiguing and lightweight which was all a plus. I was disappointed that the sound quality, its no good, but when you get past that it is still a listenable headphone and the benefit of the outstanding (even at times freaky) ability of the Noise Cancelling function makes the QC25 worthwhile. That means Bose occupies a very special place in the Audio world and for that I will enjoy using it for what it is and not what it claims to be.